After a series of improvisational jam sessions with experimental jazz drummer Steve Reich, Kieran “Four Tet” Hebden has returned with his first solo collection of original music since 2005’s Everything Ecstatic. Set for release on longtime home Domino Records, Ringer will surprise fans who only know Four Tet for his pastoral hip-hop beats and collaborations with J-Dilla. Ostensibly a techno album, the four-track EP seamlessly moves from light fusion Afrobeats to deep and mystical grooves. It continues Four Tet’s revision of his former identity as a Boards of Canada-influenced producer without sacrificing the restless imagination of his earlier material. 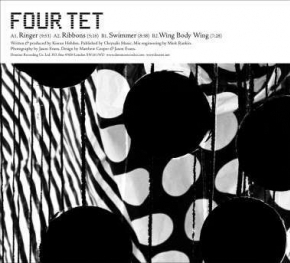 Smartly, Four Tet isn’t waiting for Ringer to leak onto the Internet like a deflated balloon. You can purchase a DRM-free digital copy now at the website for New York indie store Other Music, but you’ll have to wait until May 6 to purchase a physical copy. The Ringer track listing is below. This entry was posted in News and tagged Domino Records, Four Tet. Bookmark the permalink.